Shake off the beach sand with Walter Green Boutique’s round towels. Toss aside your regular ol’ beach towel and grab one that’s larger in size and cuter than ever. 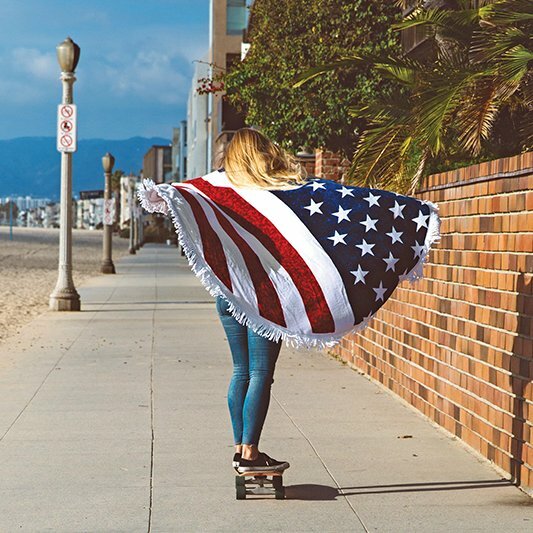 The Vagabond brand towels come in a variety of colors, but if you’re feeling patriotic, take a look at the American flag lookalike towel — perfect for a beach-style 4th of July celebration. Summer’s sips tend to be iced, with a sweet, inviting taste. Let Coton Colors keep your sweet tea, lemon water or whatever secret concoction you’ve created for your summer evenings crisp and cold in their Tervis Tumblers. The brightly colored cups are adorned with seahorses, bumblebees, owls and more. If you’re staying home for the summer, host a dinner party or two with Coton Colors Restored Retro dinnerware, serveware, linens and décor. The plates, cups, bowls, napkins and more all grab the attention of those near and far with their bright colors. Painted with vivid hues of blues, greens, oranges and reds, you’re sure to have the table setting of the summer. For all the Tallahassee gentlemen trying to beat the heat, Nic’s Toggery has you covered. In both Southern Tide and Mizzen+Main brands, performance-wear collared, plaid shirts are waiting to be purchased. The lightweight material means your style won’t falter while you stay cool and breezy during a hot, humid Tallahassee afternoon. Don’t let the heat keep you from looking your best! Despite the relaxation and tranquility that inevitably comes with the summer months, everyone needs a place to jot down events, dates, notes, thoughts and to-do lists. Life never stops, but make sure to stop by The Grey Fox and check out their stacks of agendas and planners — specifically the Simplified Planner. Designed by Emily Ley, this planner helps to minimalize your day-to-day routine in a basic and organized way. Don’t let your beverages get warm: Let M&M Monogramming keep things cool with their wide variety of coolers. From large totes to six-pack coolers, your drinks won’t stand a chance against the midday heat. The colorful patterns filled with stripes, shells and flowers will stand out among the rest, making these coolers a difficult object to misplace. And an extra twist? Apply your monogram, of course!